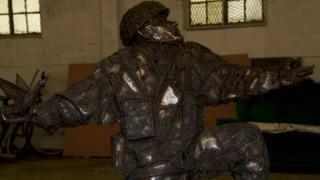 A sculpture incorporating more than 4,000 replica bullets has been unveiled ahead of the 75th anniversary of D-Day. Soldiers of Sacrifice represents Denham Brotheridge, believed to be the first Allied soldier to be killed by enemy action on D-Day in June 1944. Artist Alfie Bradley said it was a "lasting tribute" to those who lost their lives. The sculpture is due to go on a tour of England and Normandy before reaching its permanent home in Portsmouth. The soldier's form is crouched down as if to throw a grenade, but instead he is releasing a dove of peace. The artwork is positioned on a base made of replica bullets to represent the 4,414 Allied servicemen who lost their lives in the first 24 hours of the invasion of Normandy. Lt Brotheridge, of D Company, 2nd Oxfordshire and Buckinghamshire Light Infantry, was mortally wounded in an attack which secured the bridge at Benouville. His wife Maggie was pregnant with their daughter Margaret at home in Smethwick, Birmingham at the time. Now aged 75, she will accompany the National Lottery-funded sculpture of her father after its unveiling in Salford, as it goes on tour before being positioned at the D-Day Story Museum in Portsmouth. Mr Bradley, best known for the Knife Angel he created from 100,000 knives surrendered during amnesties, said it had been a "meaningful project" to have worked on. "Den Brotheridge was 28, the same age I am now, when he died," he said. "I can't even begin to imagine how terrifying it would have been to land on the beach in Normandy that day. "The more I've read up on D-Day over the last few months, the more I realise how grateful we all should be for their heroic sacrifice." D-Day Soldiers of Sacrifice tour venues:4 March: The Piazza, Media City, Salford; 5 March: Liverpool Parish Church (Our Lady and Saint Nicholas); 6 March: Villa Park, Birmingham; 7 March: Waterloo Station, London; 8 March: Bletchley Park, Bletchley; 9 March: South Parade Pier, Portsmouth; 10 March: Pegasus Beach Bridge, Normandy, France; 11 March: The D-Day Story, Portsmouth.